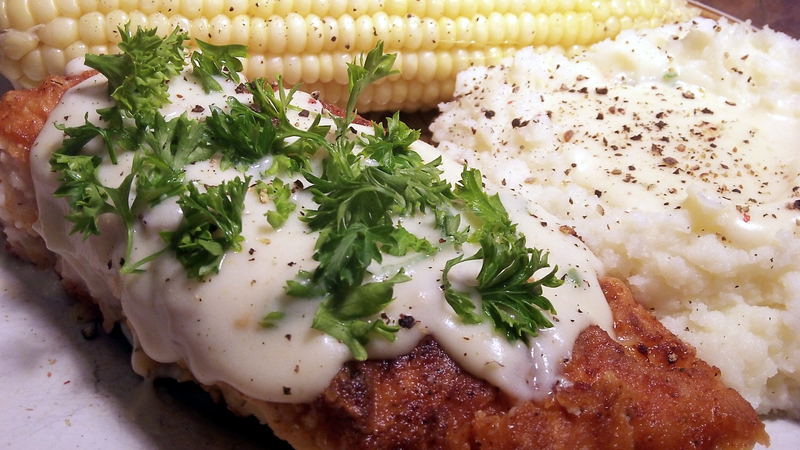 MFC (Maryland Fried Chicken) is perfect for Sunday dinners or when you’re entertaining guests. Serve with whipped buttered potatoes, green beans or fresh ears of corn with butter. Fresh dinner rolls are an excellent addition as well—ever try 7-Up rolls? You may need to google them for now, but the recipe is forthcoming. Enjoy Y’all! *Brining: this step is optional, but recommended. Brining adds flavor, tenderness and makes the chicken very moist. If you choose not to brine, move onto the next step. In large plastic container, dissolve ¼ cup salt and 3 Tablespoons of granulated sugar in 4 cups of water. Remove skin from chicken pieces (optional) and place in container. Add more water if necessary to cover chicken. Place lid on container and place in refrigerator for 2-3 hours. Remove from brine and drain. Continue on to next step or place in the refrigerator for 2-8 hours to “cold dry” the pieces (optional). Pour milk into medium-sized bowl. Add egg and beat with fork until combined; set aside. In a medium shallow bowl add flour, seasonings, baking powder, baking soda and chicken powder, mix well with fork. Dredge chicken pieces in flour mixture, dip in milk and egg mixture and again, roll in flour mixture. If you have the time let coated pieces sit 15-30 minutes before frying, dust with additional flour if pieces become too moist. This step makes the crust extra crispy. In a large deep cast iron skillet fry bacon until crisp. Remove with slotted spoon; drain on paper towel—set aside. Add oil to bacon drippings until about 1″ deep. Heat oil to about 375 degrees and add chicken pieces—don not crowd pieces. Cook chicken on medium heat for about 8-10 minutes per side or until juices run clear. Transfer chicken to serving platter and top with gravy and crumbled bacon if desired. Make a roux by melting butter over low heat. Whisk in flour and continue to stir until roux is golden. Slowly stir in broth then milk, chopped parsley and tarragon, if using. Continue to whisk to keep gravy smooth. Simmer on low heat until gravy thickens. Add salt and pepper to taste. Spoon over fried chicken and top with additional chopped herbs and fresh cracked pepper if desired. If you really want to get bold, you can also top with crumbled bacon…AMAZING!! Previous Post It’s Guest Chef Wednesday! Bret Clark’s Fresh Clams & Mussels, Pasta Aglio Olio and Killer Marinated Tomatoes!